For the first time since 1989, New York's Whitney Museum is showcasing an Andy Warhol exhibition, "From A to B and back again". It is the Pop artist's adoptive hometown and the expo takes a look at his life's work. The Curator Donna De Salvo wanted to give a more personal approach to the artist whom she knew personally for many years. She looks behind Warhol’s carefully constructed mask to explore how a gay man raised by Czech immigrants in a Catholic family became one of the world’s most experimental artists. "The exhibition walks people like us through the early work of Warhol when he was a commercial illustrator working in the fashion industry in New York. And then through the pop work, the more revolutionary, paradigm-shifting way of making a painting. But also the work that Warhol was making after the '60s, and often the work that people saw as maybe not as important, not as interesting, was not critically well-received," she says. Warhol was very much of his time, but it was a pioneering time that ensured the noise Warhol made would be left to reverberate down the ages into today's full-blown celebrity culture, wher his maxim "Everyone can be famous for 15 minutes" appears to have come true. "I do think that he understood something about the strong - I think he was interested himself - in celebrity culture. As a young boy, he was interested in Shirley Temple, and wrote away to get publicity photographs. Warhol comes out of an age, actually, where radio was surprisingly was what he grew up with, and then eventually television. But he also looks at every moment in the culture, and the rise of different technologies to deliver information. As an artist, he's very astute. I always believe sometimes, oftentimes, artists are ahead. They're able to see things that the rest of us haven't seen or don't know," says De Salvo. 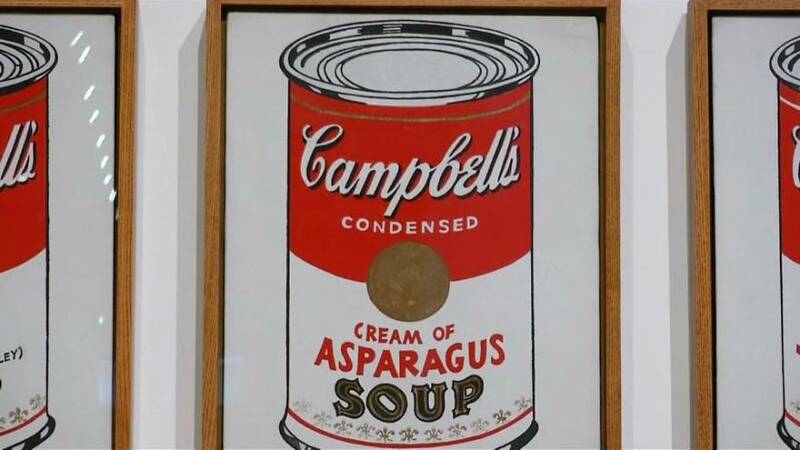 Few 20th Century artists explored and merged the topics of commercial culture, celebrity and media quite the way Andy Warhol did, or to such extent, and the show is spread out across three floors at the Whitney museum. More than 350 works are on display, some of which are on loan from other museums, collections and galleries for the retrospective. As its name suggests, "Andy Warhol-From A to B and Back Again," the exhibition is not modest in its aim to capture the whole of Warhol's iconic oeuvre. And so the landmark "Soup Cans" are front and center at the show, as are "Coca Cola (3)," "Mao" and other famed works. "This exhibition is an attempt to really see the whole as much as one can with any one artist," says De Salvo, "but it's holistic." Indeed, the show makes pains to provide equal footing to Warhol's earlier sketches, as well as his lesser known works, such as his works devoted to disasters and the occult. Towards the end of his four-decade career, Warhol collaborated with the likes of Jean-Michel Basquiat, and the pair's joint work serves as a bookend to displays devoted to Warhol's early work that grew out of his work in New York's advertising business in the 1950's. Politics serves as the elephant in the room for any artistic collection in 2018, De Salvo noted at the viewing of the exhibition. But while the retrospective was organized without U.S. President Donald Trump in mind, she said, it's hard to consider Warhol's favorites subject matters in 2018 without Trump in mind. But while many are taking a new look at the power of celebrity and media in the age of Trump, perhaps Warhol saw it all coming. The show will open to the public on November 12, 2018 and will run until March 31, 2019 at New York's Whitney Museum.